A murder trial today (Tuesday) heard the tapped police interview of a teenager who allegedly freaked out as he watched his father attempting to chop off the head of his girlfriend, and then threatened to kill himself rather than go to jail. The interview was played at the trial of 52-year-old David Lyness who denies murdering his 51-year-old girlfriend Anita Downey in his Toberhewny Hall home in Lurgan on January 20 last year. 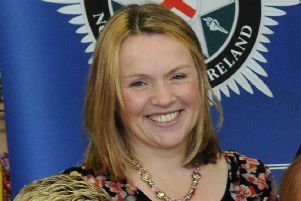 Craigavon Crown Court, sitting in Belfast, has already heard that Ms Downey was found with her throat cut back to her spine, which also severed her jugular vein. Today (Tuesday) the jury of seven men and five women listened as Lyness’ son described the near surreal situation confronting him as he watched his dad, straddling Ms Downey, ‘sawing’ at her neck, as he told him “it had to be done”. And the teenager, clearly distressed at times, was seen telling police that he couldn’t understand why Ms Downey seemed “too calm for someone who was getting their head chopped off”. Initially he described how he returned home to find his dad, already drunk, sitting playing poker on his computer. Sometime later, around midnight, Ms Downey arrived in a taxi. She was also drunk, “almost paralytic”, unsteady on her feet. But, as they went on to drink four bottles of ‘cheap Chardonnay’ between them, almost “glass for glass”, they began to argue more and more, and the teenager went to his bedroom not wanting to listen to their squabbling. However, within moments he ran back to the living room on hearing his father say, “I’m going to beat you”, and found him sitting astride Ms Downey, “punching and violently abusing her”. When he asked his dad what he was doing, he came at him, and, pushing him out of the way, stormed into the kitchen, returning with a large knife. The teenager further claimed that his father “knew what he was going for when he went to the kitchen”. And he explained: “It was just the way he stormed out, in a bad mood .... and he was only there for about a second before I heard the knife rack going .... he knew what he was going into the kitchen for”. The teenager said that Ms Downey was lying on the floor “still dazed and confused about what was going on”, and when his dad threatened him with the knife, he backed off towards the stairs “fearing” for his own life. However, again within moments he ran back to the living room when he heard Ms Downey “screaming help me, help me, he’s cutting me”. The teenager told police that when he opened the living room door this time “there was blood everywhere”. He said that his father was again sitting astride Ms Downey, but this time he was “sawing” at her neck with the knife, “the biggest one in the house”. The teenager then described hearing Ms Downey’s voice, “it was so calm ... I don’t know how she was so calm ... he was sawing at her neck ... and she just looked at me .... your dad’s cutting me. “I just don’t understand .... why are you not in so much pain .... you’re talking to me like nothing’s happening as ... he’s sitting there sawing at your neck,” said the teen before adding: “She sounded like she wasn’t in pain at all”. He further claimed that all the while to him Ms Downey knew “all life was just slipping away from her” and he just couldn’t understand how someone “who was getting their head chopped off” was so calm. Having seen the hole in Ms Downey’s neck, and the blood that was everywhere, and also ‘dripping’ from the knife in his father’s hand, the teenager said he “just freaked out” and ran from the house followed by his dad, who threatened to turn the knife on himself. Asked by police what his dad may have meant by that, the teenager replied: “well maybe he knew he was going to go to jail ... and instead of going to jail, he was going to top, kill himself”.